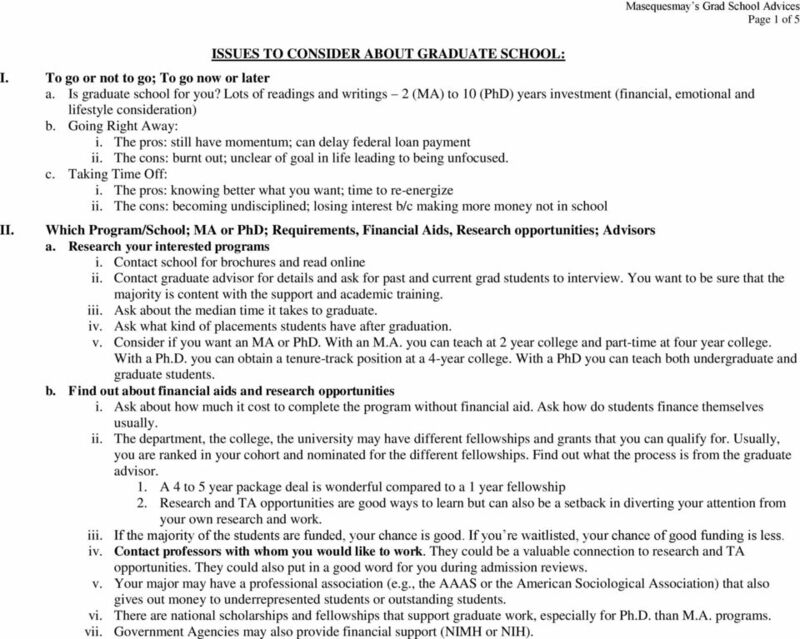 Download "Masequesmay s Grad School Advices Page 1 of 5"
1 Page 1 of 5 ISSUES TO CONSIDER ABOUT GRADUATE SCHOOL: I. To go or not to go; To go now or later a. Is graduate school for you? Lots of readings and writings 2 (MA) to 10 (PhD) years investment (financial, emotional and lifestyle consideration) b. Going Right Away: i. The pros: still have momentum; can delay federal loan payment ii. The cons: burnt out; unclear of goal in life leading to being unfocused. c. Taking Time Off: i. The pros: knowing better what you want; time to re-energize ii. The cons: becoming undisciplined; losing interest b/c making more money not in school II. Which Program/School; MA or PhD; Requirements, Financial Aids, Research opportunities; Advisors a. Research your interested programs i. Contact school for brochures and read online ii. Contact graduate advisor for details and ask for past and current grad students to interview. You want to be sure that the majority is content with the support and academic training. iii. Ask about the median time it takes to graduate. iv. Ask what kind of placements students have after graduation. v. Consider if you want an MA or PhD. With an M.A. you can teach at 2 year college and part-time at four year college. With a Ph.D. you can obtain a tenure-track position at a 4-year college. With a PhD you can teach both undergraduate and graduate students. b. Find out about financial aids and research opportunities i. Ask about how much it cost to complete the program without financial aid. Ask how do students finance themselves usually. ii. The department, the college, the university may have different fellowships and grants that you can qualify for. Usually, you are ranked in your cohort and nominated for the different fellowships. Find out what the process is from the graduate advisor. 1. A 4 to 5 year package deal is wonderful compared to a 1 year fellowship 2. Research and TA opportunities are good ways to learn but can also be a setback in diverting your attention from your own research and work. iii. If the majority of the students are funded, your chance is good. If you re waitlisted, your chance of good funding is less. iv. Contact professors with whom you would like to work. They could be a valuable connection to research and TA opportunities. They could also put in a good word for you during admission reviews. v. Your major may have a professional association (e.g., the AAAS or the American Sociological Association) that also gives out money to underrepresented students or outstanding students. vi. There are national scholarships and fellowships that support graduate work, especially for Ph.D. than M.A. programs. vii. Government Agencies may also provide financial support (NIMH or NIH). 2 Page 2 of 5 III. Application Process: GPA, GRE, Resume, Statement of Purpose, Recommendation Letters, Writing Sample a. Time management is crucial here. Do a backward timeline scheduling so you know what you need to do in order to have all materials ready for mailing before the deadline. 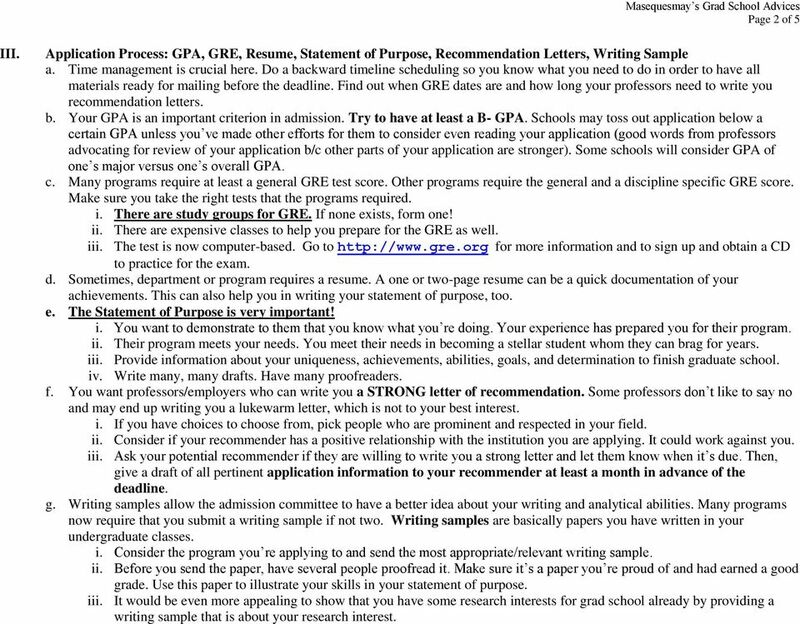 Find out when GRE dates are and how long your professors need to write you recommendation letters. b. Your GPA is an important criterion in admission. Try to have at least a B- GPA. Schools may toss out application below a certain GPA unless you ve made other efforts for them to consider even reading your application (good words from professors advocating for review of your application b/c other parts of your application are stronger). Some schools will consider GPA of one s major versus one s overall GPA. c. Many programs require at least a general GRE test score. Other programs require the general and a discipline specific GRE score. Make sure you take the right tests that the programs required. i. There are study groups for GRE. If none exists, form one! ii. There are expensive classes to help you prepare for the GRE as well. iii. The test is now computer-based. Go to for more information and to sign up and obtain a CD to practice for the exam. d. Sometimes, department or program requires a resume. A one or two-page resume can be a quick documentation of your achievements. This can also help you in writing your statement of purpose, too. e. The Statement of Purpose is very important! i. You want to demonstrate to them that you know what you re doing. Your experience has prepared you for their program. ii. Their program meets your needs. You meet their needs in becoming a stellar student whom they can brag for years. iii. Provide information about your uniqueness, achievements, abilities, goals, and determination to finish graduate school. iv. Write many, many drafts. Have many proofreaders. f. You want professors/employers who can write you a STRONG letter of recommendation. 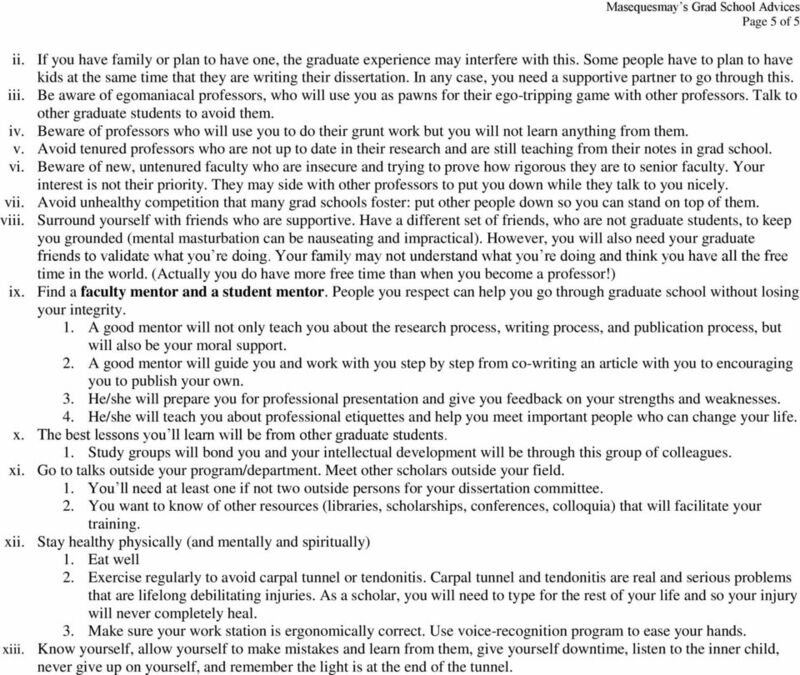 Some professors don t like to say no and may end up writing you a lukewarm letter, which is not to your best interest. i. If you have choices to choose from, pick people who are prominent and respected in your field. ii. Consider if your recommender has a positive relationship with the institution you are applying. It could work against you. iii. Ask your potential recommender if they are willing to write you a strong letter and let them know when it s due. Then, give a draft of all pertinent application information to your recommender at least a month in advance of the deadline. g. Writing samples allow the admission committee to have a better idea about your writing and analytical abilities. Many programs now require that you submit a writing sample if not two. Writing samples are basically papers you have written in your undergraduate classes. i. Consider the program you re applying to and send the most appropriate/relevant writing sample. ii. Before you send the paper, have several people proofread it. Make sure it s a paper you re proud of and had earned a good grade. Use this paper to illustrate your skills in your statement of purpose. iii. It would be even more appealing to show that you have some research interests for grad school already by providing a writing sample that is about your research interest. 3 Page 3 of 5 IV. Graduate School Experience a. The formal process: i. The first 2 years are taking required classes and writing your Master s Thesis. 1. You ll probably begin your thesis research end of your first year. 2. You ll need a thesis committee to consult regarding your research. a. Your Thesis Committee is usually made of at least 2 faculty members who will guide you in your master s thesis research. b. Once you are done writing up your thesis, your thesis will be reviewed by at least 2 thesis readers. The thesis readers will decide whether you pass or need to rework your thesis. They will send their recommendation to the department larger thesis committee. c. You and your thesis committee will have a chance to defend your work and respond back to the thesis readers. Your thesis committee members should be there to help and defend your work. Note I said should because they don t always. d. An agreement will be reached on whether you will make minor or major revisions to satisfy the thesis readers. If there is disagreement, there would be an arbitration committee (3rd reader) to settle the disagreement. 3. You need to have a pass on the thesis to move on to the next stage. 4. Occasionally, the department decides that you are not Ph.D. material and will urge you to discontinue the program by giving you a terminal master s degree. ii. The 3 rd and fourth year are more classes and preparing for your field or comprehensive exams. Some programs have two; others have 4 to 6 exams. 1. Basically, you need to demonstrate mastery of the field. They usually give you a list of books to read and a list of questions that could be asked on the exams. You prepare yourself and file when you ll be taking the exam. The test can involve a whole day, several days or a whole week of typing up your answer to the questions given on the beginning day of the exam. 2. Sometimes, the department allows you to come up with your own questions for the exam. In this case, it is a selfdesign exam. Often times, this self-designed exam is a literature review for your dissertation project. 3. Around this time, you should consider exploring other resources and meeting other faculty outside your department. In your dissertation time, you will need an outside faculty for your dissertation committee. 4. After taking required courses, you ll have time for elective courses. Make sure you take classes that will prepare you for the dissertation, to help you narrow down your topic of interest. a. Be careful not to get stuck with taking classes after classes without seeing an end in sight. You will always find interesting classes to take within and outside your department. b. There are too many information out there; you cannot know everything. The point is to be able to know the overall picture and where your work is situated in the larger picture. It is impossible to know everything. 4 Page 4 of 5 iii. Your fifth-year and on involves preparing your dissertation proposal or project. 1. You need to write up a dissertation proposal and have it approved by your dissertation committee before you can carry out your dissertation project. a. 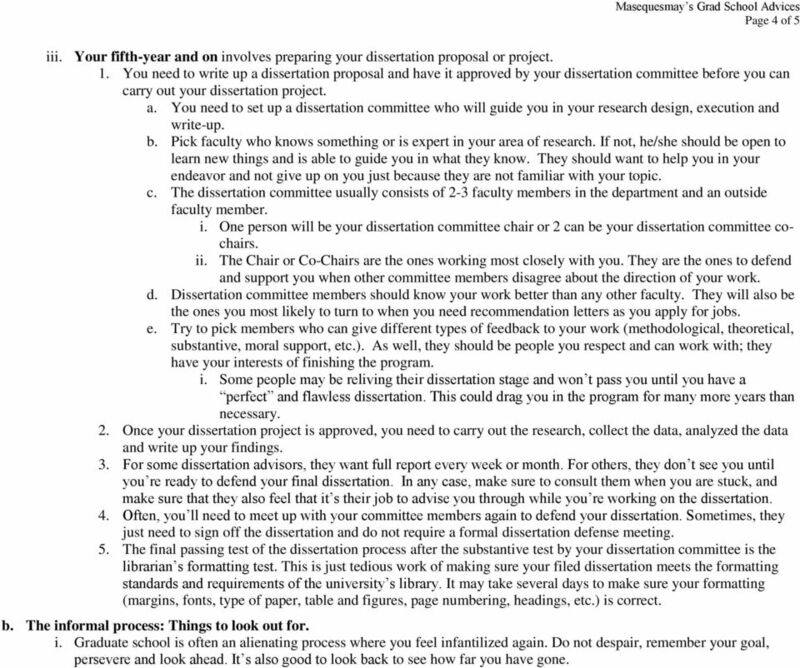 You need to set up a dissertation committee who will guide you in your research design, execution and write-up. b. Pick faculty who knows something or is expert in your area of research. If not, he/she should be open to learn new things and is able to guide you in what they know. They should want to help you in your endeavor and not give up on you just because they are not familiar with your topic. c. The dissertation committee usually consists of 2-3 faculty members in the department and an outside faculty member. i. One person will be your dissertation committee chair or 2 can be your dissertation committee cochairs. ii. The Chair or Co-Chairs are the ones working most closely with you. They are the ones to defend and support you when other committee members disagree about the direction of your work. 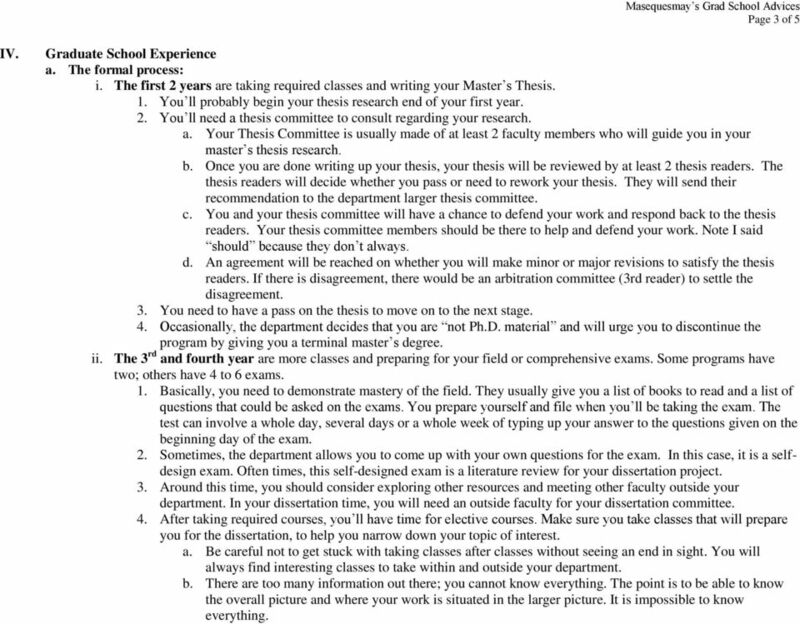 d. Dissertation committee members should know your work better than any other faculty. They will also be the ones you most likely to turn to when you need recommendation letters as you apply for jobs. e. Try to pick members who can give different types of feedback to your work (methodological, theoretical, substantive, moral support, etc.). As well, they should be people you respect and can work with; they have your interests of finishing the program. i. Some people may be reliving their dissertation stage and won t pass you until you have a perfect and flawless dissertation. This could drag you in the program for many more years than necessary. 2. Once your dissertation project is approved, you need to carry out the research, collect the data, analyzed the data and write up your findings. 3. For some dissertation advisors, they want full report every week or month. For others, they don t see you until you re ready to defend your final dissertation. In any case, make sure to consult them when you are stuck, and make sure that they also feel that it s their job to advise you through while you re working on the dissertation. 4. Often, you ll need to meet up with your committee members again to defend your dissertation. Sometimes, they just need to sign off the dissertation and do not require a formal dissertation defense meeting. 5. The final passing test of the dissertation process after the substantive test by your dissertation committee is the librarian s formatting test. This is just tedious work of making sure your filed dissertation meets the formatting standards and requirements of the university s library. It may take several days to make sure your formatting (margins, fonts, type of paper, table and figures, page numbering, headings, etc.) is correct. b. The informal process: Things to look out for. i. Graduate school is often an alienating process where you feel infantilized again. Do not despair, remember your goal, persevere and look ahead. It s also good to look back to see how far you have gone. 5 Page 5 of 5 ii. If you have family or plan to have one, the graduate experience may interfere with this. Some people have to plan to have kids at the same time that they are writing their dissertation. In any case, you need a supportive partner to go through this. iii. Be aware of egomaniacal professors, who will use you as pawns for their ego-tripping game with other professors. Talk to other graduate students to avoid them. iv. Beware of professors who will use you to do their grunt work but you will not learn anything from them. v. Avoid tenured professors who are not up to date in their research and are still teaching from their notes in grad school. vi. Beware of new, untenured faculty who are insecure and trying to prove how rigorous they are to senior faculty. Your interest is not their priority. They may side with other professors to put you down while they talk to you nicely. vii. Avoid unhealthy competition that many grad schools foster: put other people down so you can stand on top of them. viii. Surround yourself with friends who are supportive. Have a different set of friends, who are not graduate students, to keep you grounded (mental masturbation can be nauseating and impractical). However, you will also need your graduate friends to validate what you re doing. Your family may not understand what you re doing and think you have all the free time in the world. (Actually you do have more free time than when you become a professor!) ix. Find a faculty mentor and a student mentor. People you respect can help you go through graduate school without losing your integrity. 1. A good mentor will not only teach you about the research process, writing process, and publication process, but will also be your moral support. 2. A good mentor will guide you and work with you step by step from co-writing an article with you to encouraging you to publish your own. 3. He/she will prepare you for professional presentation and give you feedback on your strengths and weaknesses. 4. He/she will teach you about professional etiquettes and help you meet important people who can change your life. x. The best lessons you ll learn will be from other graduate students. 1. Study groups will bond you and your intellectual development will be through this group of colleagues. xi. Go to talks outside your program/department. Meet other scholars outside your field. 1. You ll need at least one if not two outside persons for your dissertation committee. 2. You want to know of other resources (libraries, scholarships, conferences, colloquia) that will facilitate your training. xii. Stay healthy physically (and mentally and spiritually) 1. Eat well 2. Exercise regularly to avoid carpal tunnel or tendonitis. Carpal tunnel and tendonitis are real and serious problems that are lifelong debilitating injuries. As a scholar, you will need to type for the rest of your life and so your injury will never completely heal. 3. Make sure your work station is ergonomically correct. Use voice-recognition program to ease your hands. xiii. Know yourself, allow yourself to make mistakes and learn from them, give yourself downtime, listen to the inner child, never give up on yourself, and remember the light is at the end of the tunnel. (most recent revision November 8, 2013) Humboldt State University 1 Harpst Street Arcata, CA 95521-8299. 707-826-3653 envcomm1@humboldt. NOTE: No special application form is required for financial assistance: financial assistance is considered for all acceptable applicants.